While the terms are used interchangeably, the share market should not be confused with stock market. In a stock market, besides shares, other securities like mutual funds, bonds and other derivative contracts can be traded as well. When someone becomes a shareholder, they earn a part of the profits made by the company in the form of dividends. If the company suffers a loss, the investor too suffers a loss. In a stock market, besides shares, other securities like mutual funds, bonds and other derivative contracts can be traded as well. You cannot directly approach the share market for buying/selling shares, therefore you need a broker for this task. Always be disciplined. There will be times when you will panic, but be patient, because success does not have to be rapid. Open a trading and a demat account. You cannot be dealing in shares without having these. The next most important task is researching and deciding on which shares to buy. After deciding you can inform your broker and they will perform the trading on your behalf. Or, you can do it yourself using the online trading platforms that your broker provides. Buying and selling occurs through two exchanges (in India) – the National Stock Exchange (NSE) and Bombay Stock Exchange (BSE). You will need to choose one through which you will buy/sell. In case you are not sure about certain aspects, your broker should be available to help you out. 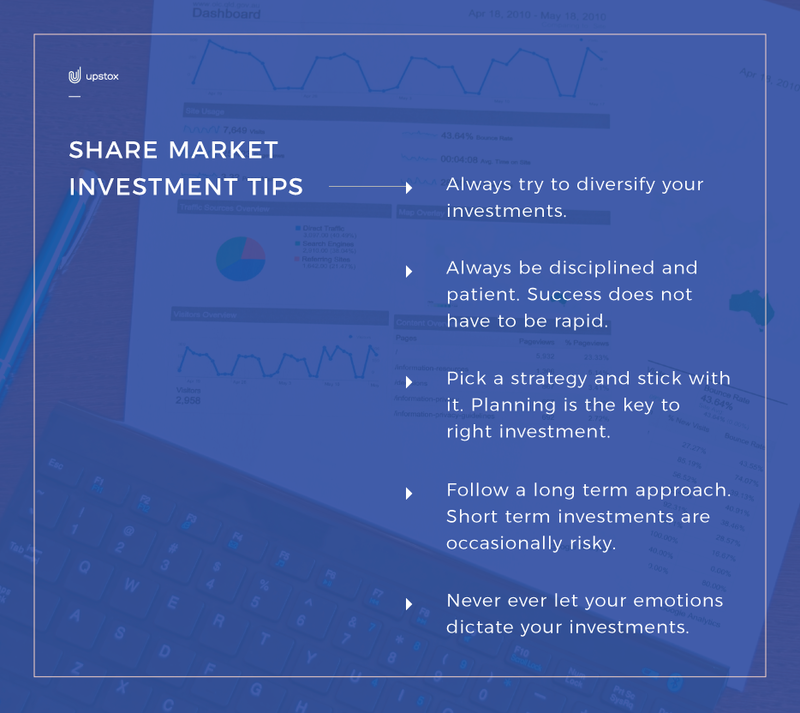 Some tips can be of help while investing in shares; in case you are a beginner. The regular investors too should keep these points in mind while trading. These tips can always prove to be helpful whenever you get involved in the share market. Always ensure that you possess all the documents required and fill all the forms carefully to avoid any future hassle. Try to choose the right broker and always give clear instructions to your broker while performing a trade. Make your own decisions. Perform your own research and avoid listening to anyone and everyone. Try not to pick highly fluctuating shares, except of course if you are highly experienced and are aware what you are doing. More often than not, people think that they can gain a lot too fast and instead they end up losing a fortune. Always try to diversify your investments. A company that is rising might not always keep that position. Hence, invest in different places so that if you end up losing in one, there is always a backup. Pick a strategy and stick with it. Planning is the key to right investment. You need to plan your investment- how, when, why etc. Changing your strategy mid-way can leave you frustrated and disheartened. You can always conduct trial and error investments with small amounts that you can afford to lose. While planning, follow a long term approach. Short term investments are occasionally risky. Following a long term approach might not give you results immediately, but they are more likely to keep away unexpected losses. This also helps in increasing your understanding of the market and helps you make better and profitable decisions in the future. Never ever let your emotions (greed and fear) dictate your investments. At the onset, set out the money you can invest keeping in mind that you might lose all of it. This will help you in managing your funds more carefully and wisely. When someone becomes a shareholder, they earn a part of the company’s profits in the form of dividends. In India, buying and selling of shares occurs through two exchanges – the National Stock Exchange (NSE) and Bombay Stock Exchange (BSE). Remember to research well in advance to prior to placing your first trade and diversify your investments.